Bob Cury at RJC Yachts calls with news that his colleague Raymond Young has sold the 39.62 tri-deck motor yacht Believe in an in-house deal. Built by Westport in 2005 as part of their 130 series, she was designed by Bill Garden and Greg Marshall. An interior from Sheryl Guyan of Pacific Custom Interiors features cherry wood joinery throughout. Believe is equipped with twin MTU 12V 2000 M90 engines, allowing top speeds of 28-plus knots. Her interior accommodation comprises five staterooms including an on-deck master suite and two VIP king-size staterooms with en suite bathrooms below. Her skylounge hosts a home theatre with 63 inch television and she has an on demand Kaleidescape film and music system throughout. Upgrades over the years include a new exterior paint job by Rybovich in 2010, new soft goods inside, three new waverunners, Jastrom digital steering and Asea seamless power transfer, and her custom hot tub was relocated to the bow. 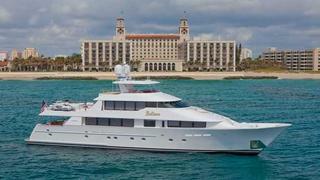 Believe was asking $9.9 million and will be renamed Chasing Daylight. Following a maiden holiday voyage with the new owners, she will join the RJC charter fleet.